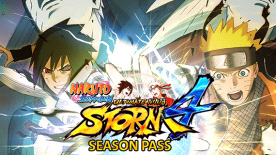 Expand your NARUTO SHIPPUDEN: Ultimate Ninja STORM 4 journey with the Season Pass! Get access to the three NARUTO SHIPPUDEN: Ultimate Ninja STORM 4 add-on packs at a discounted price and receive an exclusive secret combination technique with the release of the first downloadable content. *One of the Secret Techniques can't be used unless obtaining pre-order bonus content.